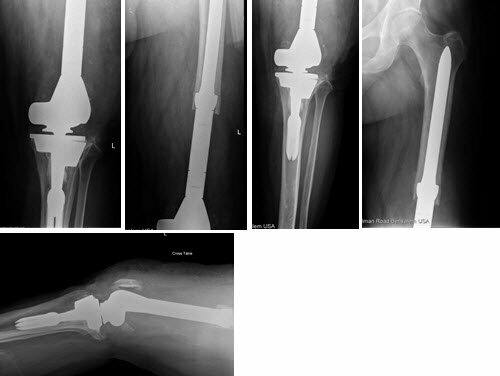 This case report illustrates a unique case of a patient presenting with a loose distal femoral replacement that had been revised but went on to subside and need further revision. A 63-year-old male with past medical history of hypertension presented to our clinic in 2011. He had undergone 11 left knee surgeries, starting with a work-related injury in 1983. These surgeries included a primary total knee arthroplasty in the 1990s, multiple revisions of a knee replacement for infection, and, ultimately, a distal femoral replacement in 2003 at the age of 54. At the time of presentation, the patient reported severe and intolerable pain in his left leg. Radiographic evaluation showed radiolucent lines circumferentially around his femoral component (Figure 1). Figure 1. Preoperative images demonstrating a loose femoral component. The patient had a negative workup for infection (normal erythrocyte sedimentation rate, normal C-reactive protein, normal synovial fluid aspirate) and underwent revision distal femoral replacement with a fully porous coated stem (Figure 2). Figure 2. Immediate postoperative images demonstrating revised femoral and tibial components. Four weeks after surgery, his femoral stem was noted to have subsided (Figure 3). He was then instructed to be non-weight-bearing for 6 weeks. The pain returned once the patient resumed weight-bearing. Figure 3. One-month postoperative films demonstrating 2 cm subsidence of the femoral component. 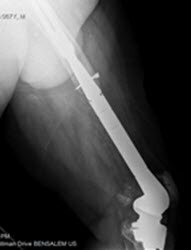 He again had a negative workup for infection, and given the lack of osseointegration and continuing pain, he underwent a revision procedure. The femoral component was found to be grossly loose and easily removed. Because of the early failure of the prior construct, a unique construct with a metaphyseal sleeve was used to provide initial fixation (Figure 4). Figure 4. Radiographs after the last revision surgery, demonstrating the use of a 46-mm sleeve. The cable was applied prophylactically to reduce the risk of fracture during femoral preparation. Three years after revision femoral replacement surgery, the patient is doing well and has satisfactory restoration his activities of daily living. In addition, he is no longer taking pain medication. As our patients age, they may require multiple revisions. Distal femoral replacement is an option when surgeons encounter massive bone loss and absent collateral ligaments. We present a unique case of a morbidly obese patient in whom a metaphyseal sleeve was used to provide stable fixation for a distal femoral replacement. A study from our institution showed mean functional KSS improving from 47.9 to 61.1 and mean WOMAC from 55.3 to 25.9 when a metaphyseal sleeve was used in revision TKA procedures. At minimum 2-year follow-up, two tibial sleeves (2.4%) required revision in a population with mostly Type IIb and III defects. This was a unique use for the metaphyseal sleeve that differs from prior reports. Distal femoral replacement is a technically difficult surgery. Multiple standard surgical landmarks are no longer present, including femoral condyles and collateral ligament tension. Thus, careful attention must be paid to certain key portions of the reconstruction, and surgical pearls are listed below. Laura Matsen Ko, MD, is an adult reconstruction fellow at The Rothman Institute, Thomas Jefferson University, Philadelphia, Pennsylvania. Matthew S. Austin, MD, is Director of Joint Replacement Services at The Rothman Institute, Philadelphia, Pennsylvania. Lombardi AV “Distal femoral replacement offers a valuable option for periprosthetic fracture” Orthopedicstoday published online March 2014, accessed September 20, 2014. Labek G, Thaler M, Janda W, Agreiter M, Stockl B “Revision rates after total joint replacement: Cumulative results from worldwide joint register datasets” J of Bone and Joint Surg Br. March 2011 Vol 93-B, No 3 293-7. Gothesen O, Espehaug B, Havelin L, Petursson G, Lygre S, Ellison P, Hallan G, Furnes O “Survival rates and causes of revision in cemented primary total knee replacement, A report from the Norwegian Arthroplasty Register 1994-2009” J Bone and Joint Surg Br. May 2013 Vol 95-B no 5 636-42.